What is the set-out time? To guarantee pick up, we recommend you place your residential trash container out at the curb by 5:00 AM on your collection day. How should I put my garbage container out for collection? Please visit the Residential section which outlines cart placement and pickup guidelines. 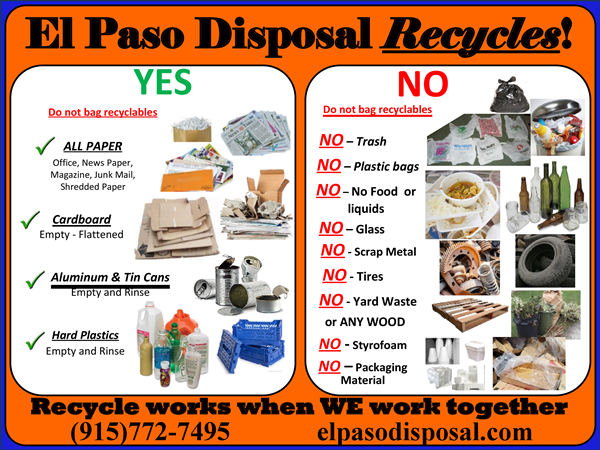 What items are not allowed in ALL El Paso Disposal trash containers? What items are allowed in the commercial recycling containers? What items are not allowed in the commercial recycling containers? Call 1-855-569-2719 to make payment through our interactive voice service.